Veteran spacewalker Shane Kimbrough and ESA Astronaut Thomas Pesquet blazed through a busy EVA timeline, checking off all of the spacewalk’s objectives that included the installation of an upgraded computer box on the Station’s truss segment, inspecting an ammonia valve module for leaks, maintaining the Dextre robot and replacing a pair of cameras that had lost their lighting fixtures. U.S. EVA-40 had a duration of six hours and 34 minutes and set the stage for Sunday’s relocation of the PMA-3 module that will be followed by another excursion next week to outfit the module in its new location and complete more work outfitting the Station. 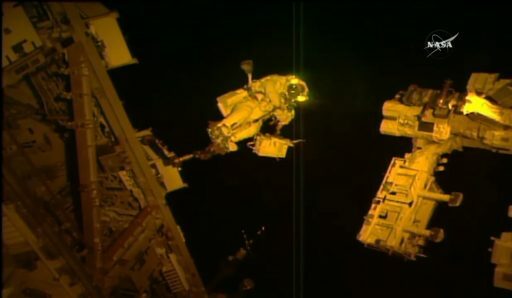 Friday’s EVA, the 198th ISS spacewalk, was the fifth for Shane Kimbrough and the second for Thomas Pesquet – both had worked together on a spacewalk back in January supporting the replacement of batteries on the Station’s truss. Operations picked up after the crew’s early morning wake-up with Peggy Whitson and Russian crew member Oleg Novitsky helping the two spacewalkers into their suits for a 100-minute long pre-breathe operation ahead of final checks and reconfigurations of the two Extravehicular Mobility Units. As has been the usual case with this particular crew, they remained well ahead of the day’s timeline, pressing into depressurization of the airlock to head outside with over half an hour to spare. 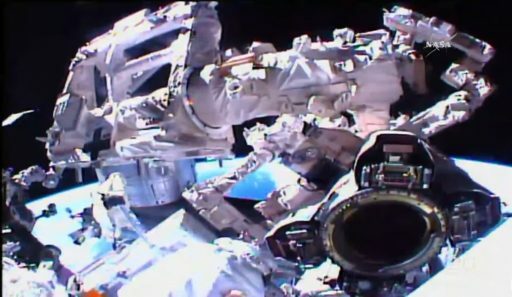 Once the airlock was at vacuum, Thomas Pesquet opened the outer hatch and the two space suits were switched to battery power at 11:24 UTC, marking the formal start of the day’s planned 6.5-hour spacewalk. Thomas Pesquet was first to climb out of the airlock, venturing into an orbital night with Shane Kimbrough following a short time later for a series of tether and suit checks before the two Astronauts parted ways. EVA-40 was set up such that the two EV crew members would work separately for the entirety of the EVA dealing with a total of five major objectives at five different worksites on the U.S. Segment of the Station. Shane Kimbrough’s first task was to move up to the S0 truss segment for the replacement of the External Control Zone 2 (EXT-2) Multiplexer-Demultiplexer (MDM) with an upgraded ‘EPIC MDM’ that uses enhanced processing and communications systems to provide more computing power and enable high-rate communications through Ethernet – essentially transitioning the Station’s Command and Control System from 1990s technology into the current millennium. ISS has close to 50 MDMs, found inside and outside the complex to route commands to all systems of ISS and return telemetry and science data for downlink to the ground, essentially serving as the brains and nervous system of the Station, interconnecting all systems. The MDMs come in different sizes and basically consist of a stack of avionics cards including data processing cards, memory units and a series of input/output cards to connect to various systems and payloads. The Station’s MDMs operate on three levels – three enhanced MDMs are used as the main controllers of all of the Station’s functions, a dozen local-level MDMs are responsible for routing commands and data from the user-level MDMs that each have specialized tasks and interface with the firmware controllers, sensors and effectors of the Station’s various systems. Over recent years, some of the internal MDMs were switched over to the new EPIC standard to enhance the Station’s computing power, Friday’s EVA marked the first EPIC MDM to move outside ISS. The focus of EVA-40 was on the EXT-2 MDM, a local-level MDM installed on the S0 truss and responsible for the Mobile Transporter, Thermal Control System, Secondary Power System and Solar Alpha Rotary Joint as well as a series of external payloads. 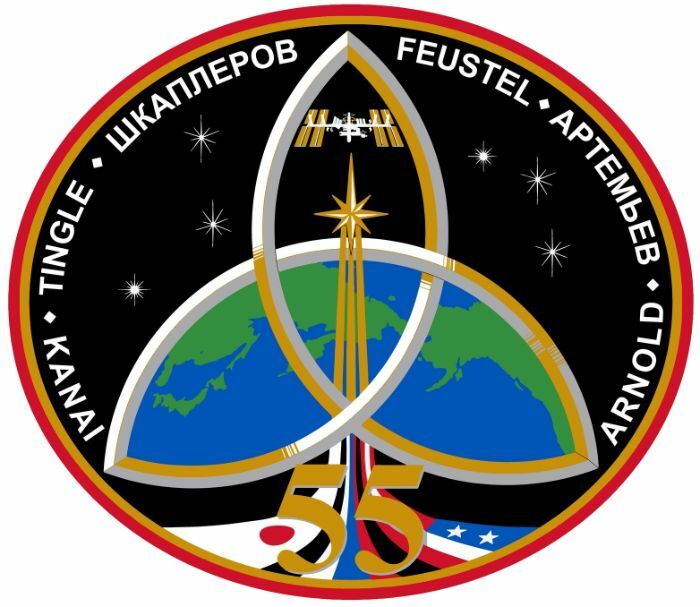 A new task to be handled by the S0 MDMs will be the Common Communications for Visiting Vehicle space-to-space communications system – requiring the MDM to be upgraded from the old design to the EPIC architecture since Ethernet capability is required for the new visiting vehicle communications system. 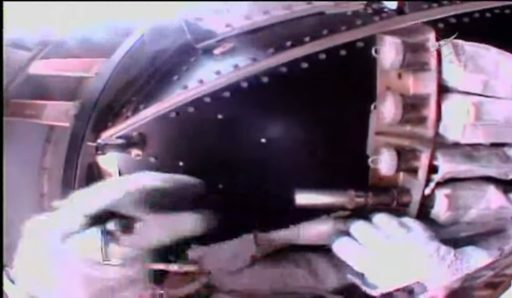 At S0, Kimbrough made quick work with his Pistol Grip Tool, releasing a pair of secondary bolts and a center jacking screw to structurally demate the computer box. 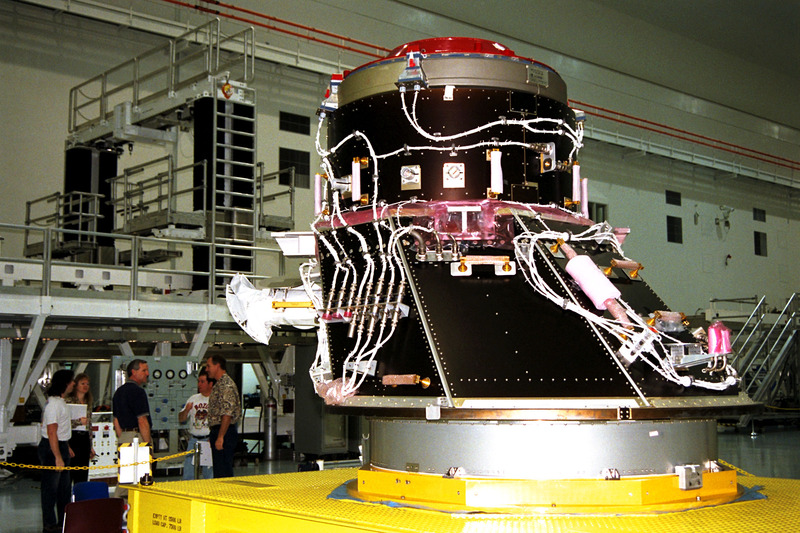 The MDM was then removed from its docked position and Kimbrough inspected the blind-mate connectors on its back as well as the ChoTherm thermal material that couples the box to its coldplate. Next, he soft-docked the new box – automatically connecting the various electrical and data interfaces. 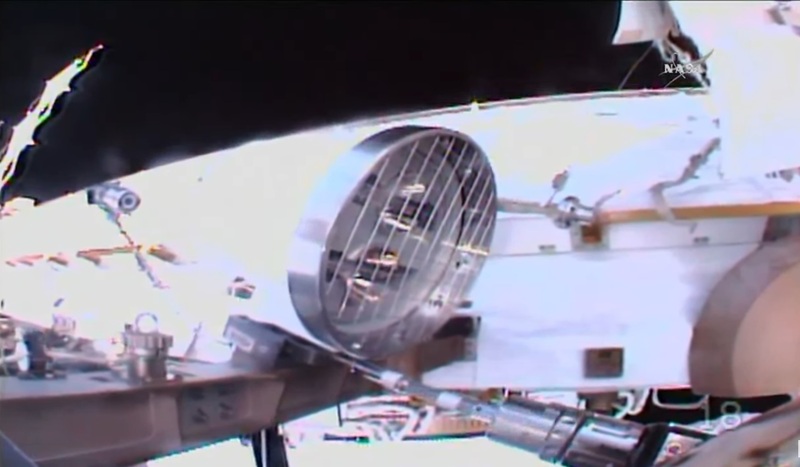 Kimbrough then drove three bolts to secure the MDM and routed a pre-staged Ethernet cable for connection via a Zero-G Lever Lock Connector to hook up the new communications system. Later in the EVA, Mission Control powered up the new EXT-2 MDM and handed some duties from EXT-1 over to the new unit to put it through its paces before all tasks will be transferred ahead of EXT-1 replacement on EVA-41 next Thursday. Kimbrough’s next task was to drop the removed MDM off at the airlock and head over to the port side of the Node 3 module to prepare Pressurized Mating Adapter 3 for its robotic relocation on Sunday. 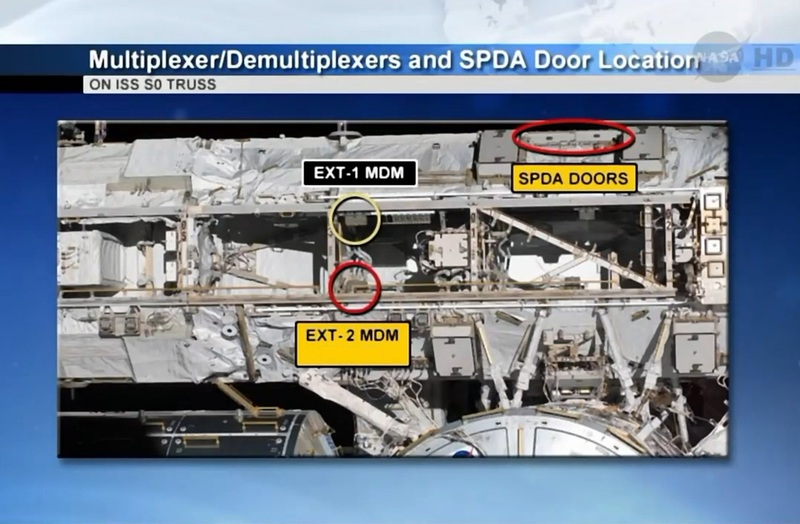 For PMA-3 to be removed from Node 3, Kimbrough had to disconnect four umbilicals connecting the PMA to ISS power and data circuitry. 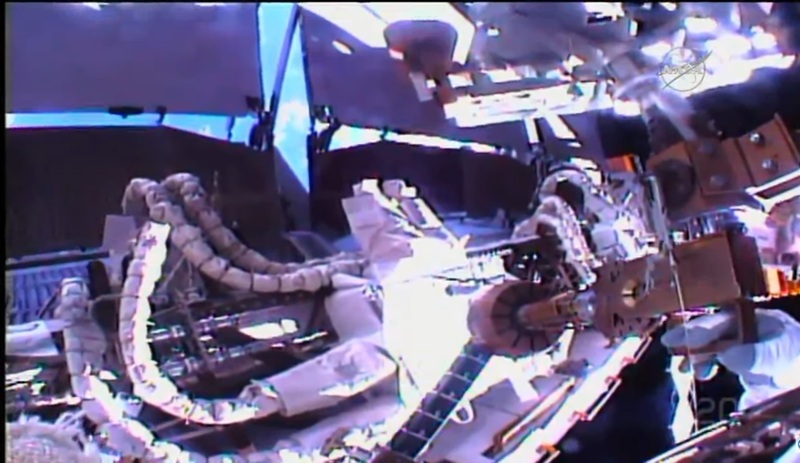 Working on the A2 patch panel, Kimbrough was facing a number of stubborn connectors he eventually levered open with an EVA hook to secure the cable bundle on Node 3 and free up PMA-3 for its robotic ride. PMA-3, delivered to ISS as one of three PMAs back in 2000, supported only a pair of Space Shuttle flights and was relocated several times over the course of its first decade in space. 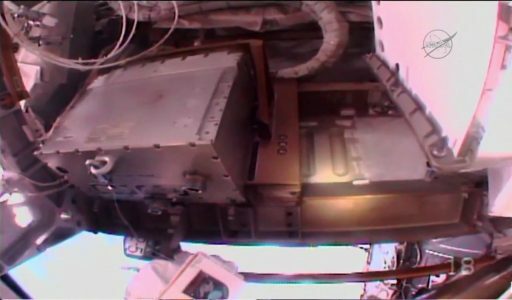 After taking its current spot on Node 3 port, the module was kept closed most of the time, serving as a long-term storage closet for some of the rarely used hardware items on ISS. 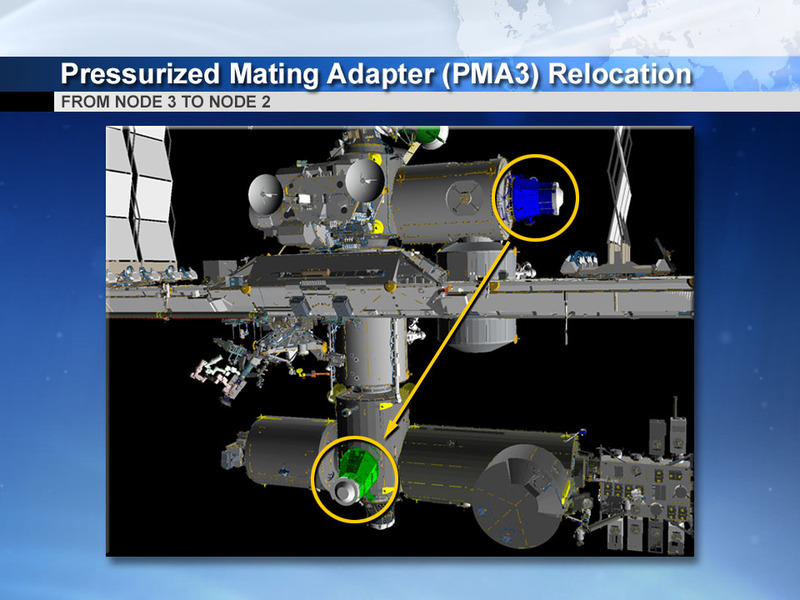 However, with the start of Commercial Crew traffic, PMA-3 will take up residence on the Zenith Common Berthing Mechanism of the Harmony module, joining PMA-2 that resides on the forward side of Node 2. The cone-shaped PMAs are nearly two meters long and host a passive Common Berthing Mechanism on the wide end and an APAS docking adapter on the narrow end, compatible with the Space Shuttle’s docking system. 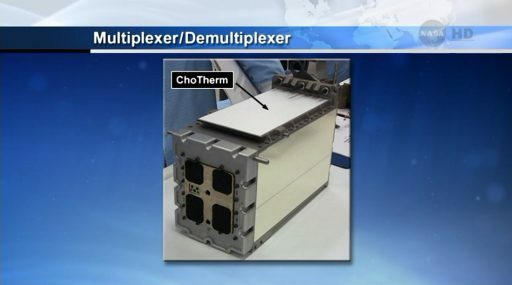 For future operations, the PMAs are outfitted with International Docking Adapters that convert the APAS end to comply with the International Docking Standard used by SpaceX’s crewed Dragon, Boeing’s Starliner and NASA’s Orion spacecraft, although Orion is currently not envisioned to fly to ISS. PMA-2 already received its adapter and is ready for operations while PMA-3 will be fitted with its IDA early next year to give ISS a pair of docking ports for commercial crew. 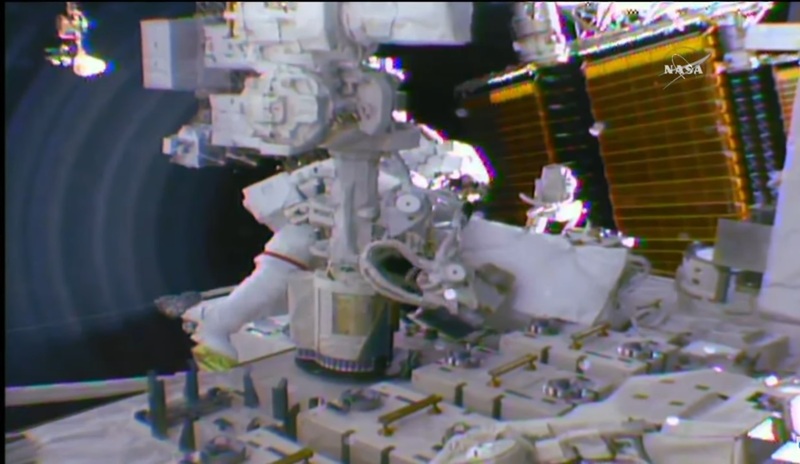 For Thomas Pesquet, the EVA began with the retrieval of a foot restraint from External Stowage Platform 2 and the translation to the P1 truss segment where he set up shop and ingressed the foot restraint to get a close-up look at a piece of equipment known as the Radiator Beam Valve Module (RBVM). The P1-3-2 RBVM routes ammonia within Loop B of the Station’s External Thermal Control System that hosts large radiators, pumps and heat exchangers to remove excess heat from the Station’s cabin and radiate it overboard. Signatures from the ammonia accumulator of Loop B have shown a decreasing ammonia quantity over a period of several months and an inspection carried out with the Robotic External Leak Locator in February zeroed-in on this particular RBVM as the source of the leak. To get human eyes on the RBVM, Mission Control dispatched Thomas Pesquet to the location for a lengthy visual inspection, also collecting still and video imagery to spot any flakes of frozen ammonia that could help pin point the leak. Pesquet carefully patted the flex hoses interfacing with the RBVM to liberate any flakes if present, then checking all the fluid quick disconnects to ensure they were seated properly and also examining the rigid fluid lines of the assembly. No flakes were seen at any point during the 2.5-hour inspection, but ground teams will comb through the HD video collected at the site to see if they can find the leak. Given the low rate of the leak, it is not a pressing issue, however, previous instances have shown that leaks can suddenly accelerate therefore it would be beneficial to know its exact location to prepare for the eventuality of an equipment replacement. After the inspection on P1 dragged on somewhat, Mission Control directed Shane Kimbrough who was ahead of his timeline to assist Pesquet and deliver a tool bag from the airlock to the S0 truss so that EV-2 could get right to work on his second task of lubricating one of Dextre’s Latching End Effectors. Climbing into his foot restraint once again, Pesquet readied his tools before Peggy Whitson maneuvered the Dextre robot to a position from where Pesquet could reach the areas to be lubricated. Lubrication of the Latching End Effectors of Canadarm2 was completed in two EVAs in 2015 and 16 and Friday’s task on Dextre was identical, budgeted for over three hours of EVA time given its tedious nature. The Station’s robots were not expected to require maintenance of their end effectors, however, to prolong their operational lives, NASA decided to lubricate their moving parts as ISS heavily relies on its robotic arm and the Dextre handyman and could not function in its current form without them. Armed with a grease gun and a makeshift tool known as the BLT, Ballscrew Lubrication Tool, Pesquet was set for a series of blind tasks, going purely by feel and using a depth finder on the BLT for help. He transferred some grease onto the BLT and started with the Center Ballscrew which is the easiest to lubricate, allowing Pesquet to get a feel for the situation. This process was then repeated for the four Latch Ballscrews with Peggy Whitson rotating the LEE after each latch was lubed. The latches of the end effector were retracted to reveal the Linear Bearing Tracks on which the latches glide when retracted and deployed. Two tracks are part of each latch and lubrication was to be done to the inside and outside of each latch, giving Pesquet plenty of work while having to keep up his concentration not to touch or lubricate the microswitches residing in between the bearing tracks. To wrap up, Pesquet lubricated the Equalization Brackets and Rollers that are in motion when the effector grapples onto a fixture. He then headed into clean up procedures to close out his second EVA. 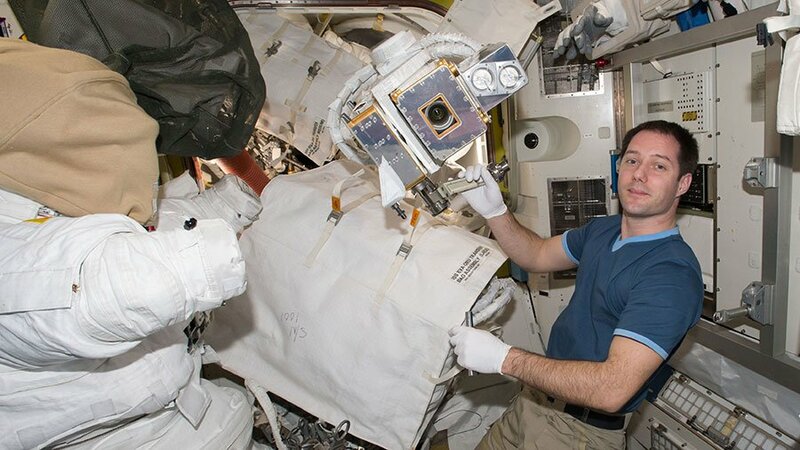 While Pesquet had both hands full, Kimbrough towed a large ORU Bag over to the Exposed Facility of the Kibo module to replace a pair of cameras that had lost their light fixtures. The individual lights can not be replaced during a spacewalk, requiring cameras to be replaced and taken inside the Station for repairs. The first camera to be replaced was located on the base of the Japanese Remote Manipulator System (JRMS) – Kimbrough had to remove a single connector and release one bolt to detach the camera, then going through the reverse process to put the spare unit in place. He then translated around the Station’s porch to access the second camera on the outboard side of the Exposed Facility. Both new cameras were powered up without issue, returning night vision to the Japanese experiment module. 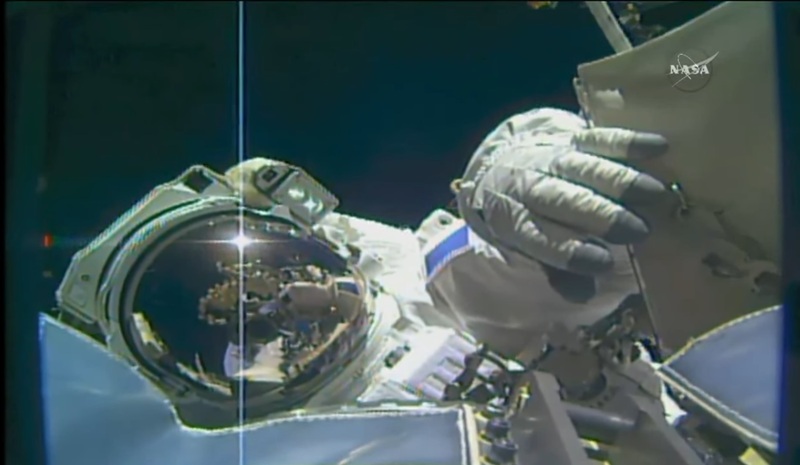 With well over 90 minutes of regular EVA time left, Kimbrough managed to check off a get ahead task from the Station’s lower-priority to-do list. He climbed over to the S1 truss segment to replace a failed light on one of the Station’s CETA carts by removing a single power connector and releasing one bolt to detach the failed unit before bolting the new one into place and hooking it up to the power line. With all tasks done plus bonus work, the two crew members met up back at the airlock to go through the usual inventory before climbing back inside Quest to hook their suits up to ISS power and cooling. Thomas Pesquet locked the external hatch and re-pressurization of Quest started at 17:58 UTC after an EVA time of six hours and 34 minutes. Friday’s EVA marked the 198th EVA in support of ISS Assembly and Maintenance for a cumulative time of 1,238 hours; it was the third excursion of Expedition 50 and also the third to occur in 2017. Shane Kimbrough now has five career EVAs under his belt for a total of 31 hours and 56 minutes while Thomas Pesquet stands at two EVAs for 12 hours and 32 minutes. Friday’s very successful spacewalk set the stage for the relocation of the PMA-3 module that will be completed on Sunday under the control of robotics specialists at Mission Control. 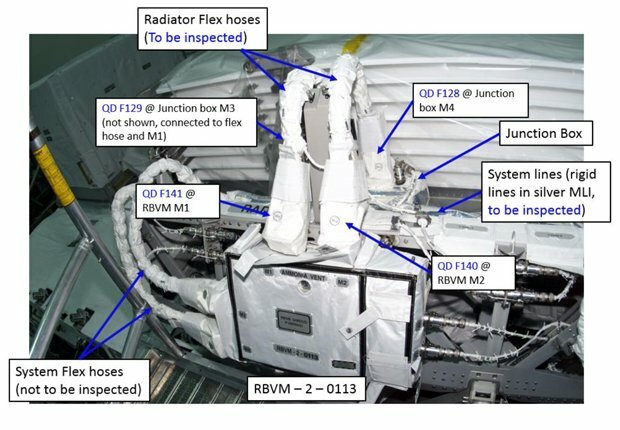 Pending successful installation of PMA-3 in its new home, the next ISS EVA is on the books for next Thursday, March 30 and will be performed by Kimbrough along with Peggy Whitson to re-connect the PMA in its new location, outfit it with debris shields and put in place protective covers on PMA’s former slot on Node 3 port. Additional tasks of EVA-41 are the installation of the second EPIC MDM on the S0 truss and the lubrication of the other end effector of the Dextre robot. 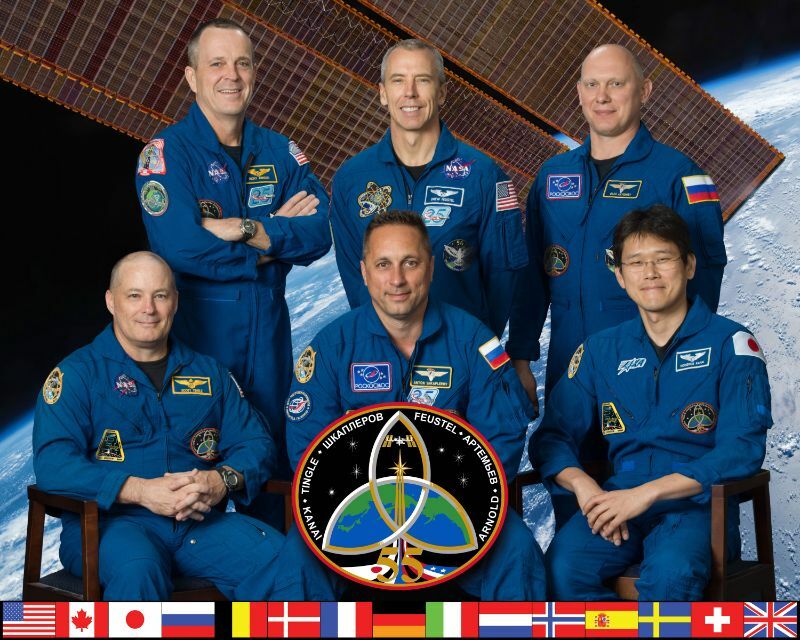 A little further down the road, another EVA is scheduled for April 6 to be undertaken by Whitson and Pesquet, however, that date is not yet set in stone as the EVA depends on the Cygnus OA-7 mission that was recently delayed and currently has not yet been re-aligned for a firm launch date.